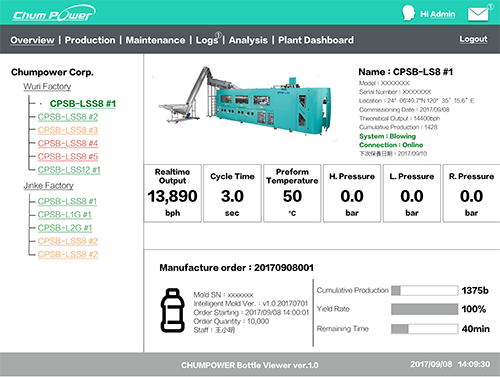 Developed by CHUMPOWER, the brand new BottleViewer intelligent bottle blower production system allows you to stay in control of all the production activities performed by CHUMPOWER blow molding machine in your factory easily from a computer browser or handheld device, including production information, production history and machine status in real time. In addition, the online service request and maintenance reminder for next service job are provided, allowing you to make an appointment for machine service right at your finger tip. The information of machines is transmitted to us as soon as it is available. Users may even talk to our service engineers online, making servicing so much easier. With the BottleViewer, the person in charge of the company or factory is given an administrator account (admin). The administrator has access to production history, information, status and operation records of all CHUMPOWER machines as well as the maintenance service history, servicing fees and spare part inventory for all CHUMPOWER machines. The administrator is authorized to establish multiple engineer accounts (Engineer), each of which may be given certain access to help the administrator for in-house management activities. The advanced version provides more and better functions for the needs of users, including: production cost that is closely related to energy consumption analysis, production cost analysis, as well as management of modes and production orders. You may choose the combination of CHUMPOWER’s Smart Mold with the BottleViewer mold management system for easy management of mold inventory, and this combination can be further integrated with production orders and even reach the perfect world where production starts immediately after molds are installed by downloading production parameters from a cloud pool. 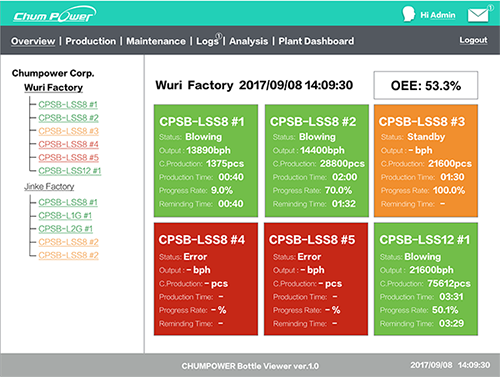 The all-seeing Plantet Dashboard provides every bit of production information, such as accumulated production capacity, OEE and yield, of all the CHUMPOWER machines in the factory with just a tap of your finger. * If you interesting in BottleViewer, please click this to contact us!